Website and processes: 15 Jul 16 Mr D.R.K., 5/5 Excellent "I would recommend you to other people." 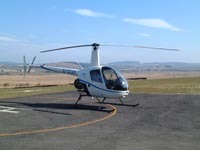 On arrival at the Helipad, the voucher holder will be greeted by our friendly team and then introduced to one of our experienced Flight Instructors. They will be shown the flying school facility and shown around the aircraft (Robinson R22) - a perfect opportunity to take photographs. After a 15 minute pre-flight brief on the effects of the controls, take to the skies and experience the freedom of helicopter flight.